CLaunch: Bridge Bay Marina, at the north end of the lake. A modern multilane ramp with excellent docks are available. CNearby campsites: Camp at Bridge Bay campground, a short walk from the marina. CComments: Easy to get a slip with electricity and water that gives excellent access to the lake and to the roads leading to the special features of the park. The Lake Hotel and the Lake Lodge (our favorite) are nearby. Meals and showers are available at Fishing Bridge, a few miles distant. You must have a park permit, available from the Ranger's office at the marina, for boating. Fishing is very good (we ate fresh trout many nights during our month here). And this is wilderness -you will see very few boats on the lake. CWant to take a hot trip on your boat? Perhaps you would like to cruise on a lake that overlies one of the largest terrestrial volcanos known to geologists? This is a cruise on top of the world's largest hydrothermal area? Former eruptions of this volcano blanketed the continent under many feet of ash and blasted a hole in the crust tens of miles in diameter. 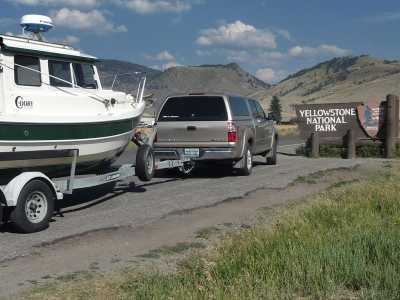 How about a cruise through Yellowstone National Park? 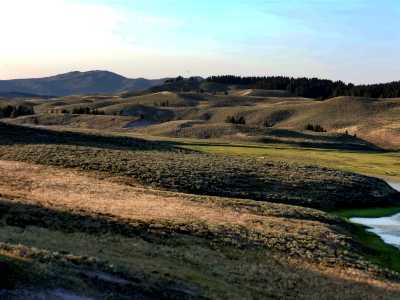 CYellowstone National Park is not just the nation's first national park, established back in 1892. It is the largest high-altitude lake in North America, and a huge outdoor geological laboratory. The lake is twenty miles north to south and 14 miles east to west, with three extensive arms and the West Thumb, a large elliptical bay on the south end. 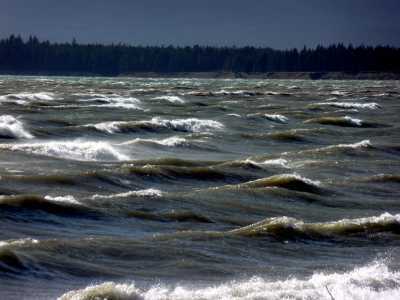 There are 136 square miles of surface area and 110 miles of shoreline. 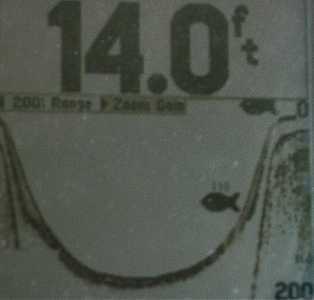 The average depth is 140 feet and the maximum depth is over 300 feet. The lake is cold and few dare to swim. 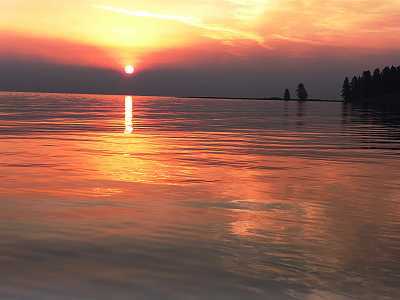 CThe National Park System has restricions on motor boating activity on the lake, either to preserve the wilderness nature of the lake or to protect wildlife. Some waterfront areas are closed and boaters may only use specified dock areas. There are sometimes temporary closures during nesting seasons or spawning times, and these locations and dates are available at the marina office. The southern ends of the three arms of the lake are reserved for paddlecraft. There are also portions of the arms restricted to speeds less than 5 mph. 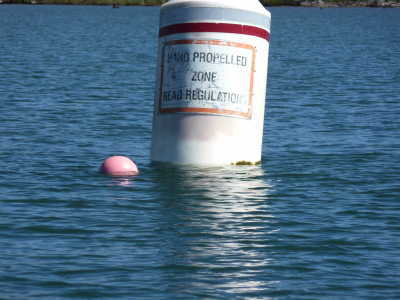 These areas are posted by bouys. 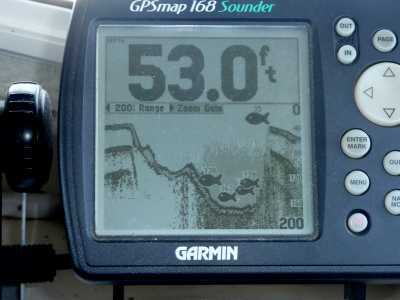 Motorized boats are also required to stay a quarter mile offshore in these slow speed zones unless they are landing ashore, and then a direct shore approach is permitted. 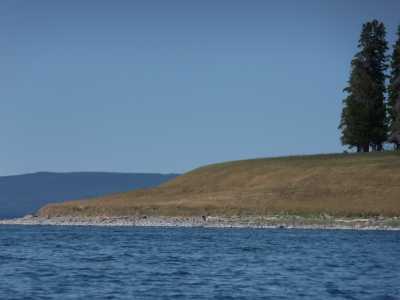 CBoaters intending to cruise Yellowstone Lake are required to register their craft with the park and place a sticker on the side near the stern. This sticker is also valid at Jackson Lake in the Tetons. CThe launch ramp and docks at Bridge Bay Marina are excellent. 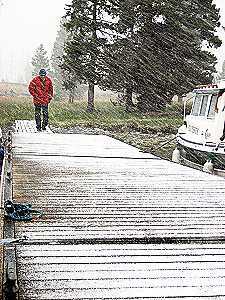 Boaters are permitted to sleep overnight at the marina and at permitted docks and anchorages on the lake with a Backcountry Permit, which can be reserved in advance for a fee or, if sites are available two days in advance, may be acquired at the ranger's office for free.You can also pick up a fishing permit from the rangers. 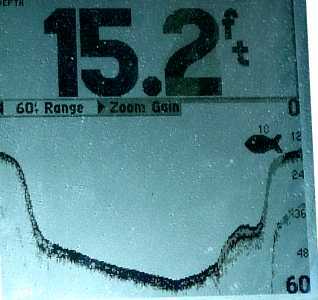 Fishing is good for Lake Trout, which are an exotic to the lake and must be kept or killed. Cutthroat Trout are declining in numbers and are catch and release. CStorms can arrive suddenly and afternoons are often breezy from the southwest in the summer. 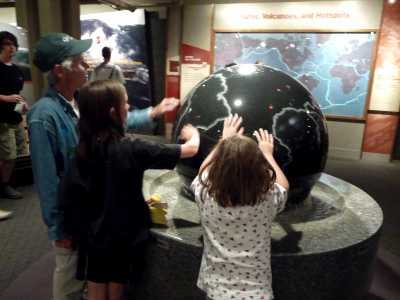 Weather predictions are available for the park on VHF Ch. 5. C Two-thirds of Earth's history is recorded here, but almost 90% of the park surface is covered by volcanic rocks that are so recent that most were deposited in the last 5% of Earth history. 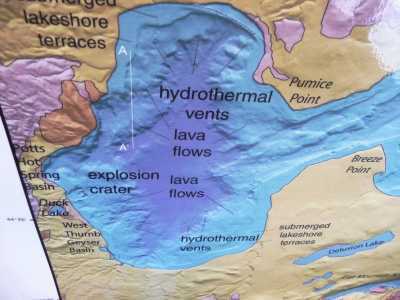 The last lava flow in the park erupted only about 70,000 years ago. 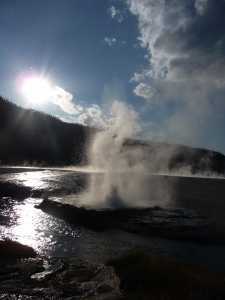 Tens of thousands of geysers, hot springs, and mudpots steam away. Large bulges, active fault zones, explosion craters and hot springs underlie the lake. And you can cruise your boat through this cauldron of geologic activity. 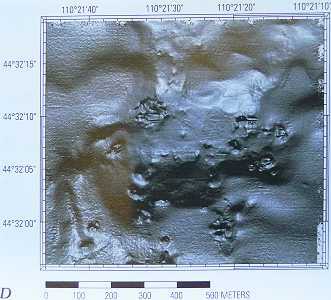 C Footprints of a huge glacier, thousands of feet thick, also track across the region. So if hot stuff doesn't pique your geological curiosity, there are plenty of other geological 'trails' to follow with your mind and eyes. Active Hot Spring, Under the Lake - Not a Spot to Anchor; An Exploded Bay? Good Grief! Iceland, Azores, Kilamanjaro, or El? CHot spots mean different things to different people --but to (most) geologists it only means one thing -- a superhot area of the mantle that drives a plume of molten rock upwards against and through the thin crust on which we live. The hot plume bulges the crust and/or ruptures it creating volcanic activity for those of us who live on the crust. 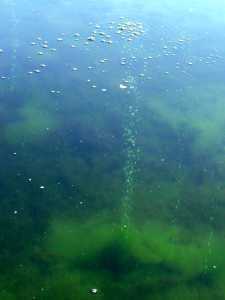 CThese are not uncommon as there are approximately 40 active hotspots on Earth today, nearly all of them in oceans. One lies beneath the Big Island of Hawaii. An interesting feature of hot spots is that the superheated area of the mantle remains relatively stationary, but the rigid crust above is usually being moved by convecting thermal currents in the underlying mantle. Thus, as the moving crust slides over the anchored heat source in the mantle, the hot spot appears to move! Hot spots leave tracks -- volcanic centers, now dormant, that have now slid off the hot mantle plume. The islands of Hawaii lie on a northwest-southeast line, with the active volcanos at the southeastern end, on the Big Island. 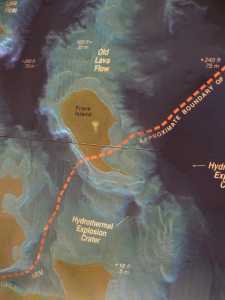 Each island was formed over the hot spot, but has moved nor'west and volcanically died as it left the hot spot. There is even a great real estate bargain in Hawaii because of this -- the Big Island is sliding off the hot spot and a new island is forming to the southeast. It is still below sea level, but is rapidly building a volcanic pile and will soon (well, in a few million years for sure) break the surface, and you are among the first to know and buy up what will surely be valuable real estate! C For the next 14 million years or so, Idaho claimed 'Yellowstone' as that part of the crust moved over the hot spot. 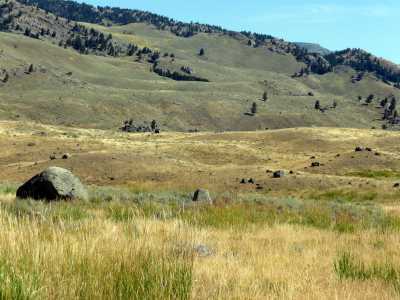 (Leaving the volcanic area known as the Snake River Plain and the National Park area, Craters of the Moon). 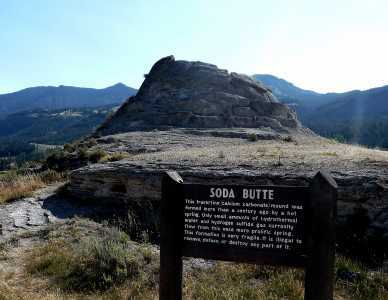 Only for the past 2.2 million years, give or take a few Mondays, has Wyoming been able to claim this tourist attraction. CtIf the North American plate continues its westward slide of about an inch a year, Canada will be able to claim the hot spot in about twenty million years. C The crust on which we live is, on average, about twenty miles thick beneath continents, and perhaps twice as thick under uplifted mountainous areas. It is thin under oceans; on average about five miles thick. It is proportionally thinner than the skin of the apple related to the underlying white 'meat.' 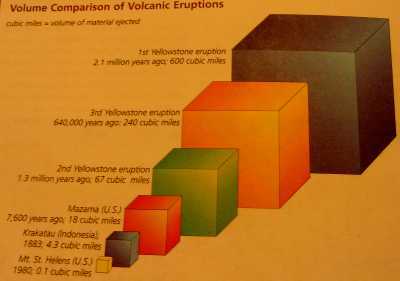 But, here in Yellowstone, molten rock exists below your feet a distance that is probably less than that from your house to your local grocery store - less than two miles. When you visit the park, you are truly skating on thin ice. 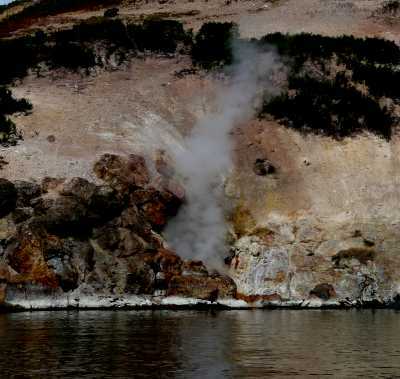 And, if on a boat on Lake Yellowstone, molten rock is probably closer to your hull, as you leave Bridge Bay, than the distance to the Lake Hotel. CThe mass of heat surging upward against the crust has resulted in chaos on the surface. In short, millions of tons of molten rock and gas exploded upward blasting ash, molten rock and gas as high as the stratosphere and spread over huge areas of the earth's surface. So much ash filled the sky that sunlight couldn't reach the surface and many years following the eruption were encased in winter. The blast threw out such a volume of rock, that a huge void was left in the crust -- what surface was left collapsed into a huge, roughly circular, pit, called by geologists a caldera. Lavas surged up through the bounding fractures of the caldera and flooded into the pit. 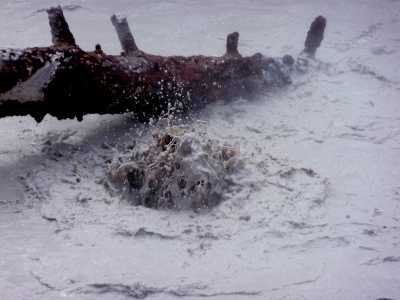 Pyroclastic (fire-broken) rock debris was scattered over tens of thousands of miles downwind. Red-hot clouds of pulverized rock and ash poured over the countryside from the initial blast and later explosions along fractures in the caldera -- these are the nueés ardente (fiery clouds) that vaporize everything in their path -- trees, animals, birds, ponds -- all disappeared in puffs of steam and ash. 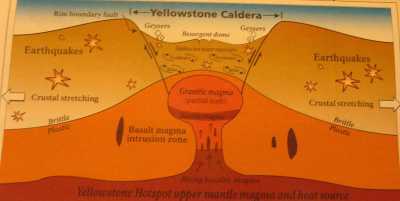 CThree times the geologic horror was repeated in Yellowstone. The first eruption, 2.1 million years ago, was perhaps the largest explosive event preserved in the geologic record of Earth. It was 6,000 times the eruptive force of Mt. St. Helens. 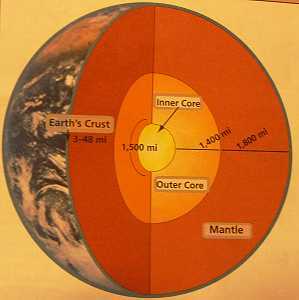 An analogy has been suggested by geologist, Hank Heasler. "Most of us have written a check for $1,000. If you write a check for 6,000 times that amount, it would be for 6 million dollars. Unlikely many of us have ever done that." CThere is a small town in Nebraska named Ashfall. 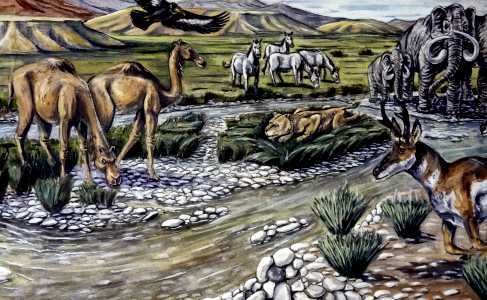 640,000 years ago it was a verdant peaceful grassland with grazing camels, small horses, rhinos, elephants and sabre-toothed deer. Then, on an otherwise quiet day, the sun went out. A gigantic cloud of ash covered the sky and the land. Eight feet of ash buried the landscape and suffocated the animals. It wasn't until the 1970's that geologic detectives traced the origin of the volcanic ash to a caldera eruption in Yellowstone. CAsh falls have buried forest numerous times in the past - at least 27 times - so today Yellowstone has over forty square miles of petrified forest - more standing petrified trees than anywhere else on Earth - and they represent over 200 species! 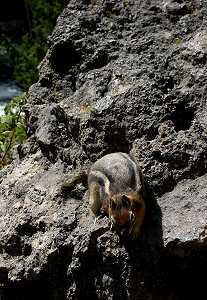 Some of the species are subtropical attesting to periods of climate warming in the geologic past. CThe average time between eruptions is about 600,000 years, suggesting that another event could occur at any time. The area is monitored by the US Geological Survey and others to determine if there are any precursor warnings. One interesting study has revealed two resurgent domes (large bulges) in Yellowstone's crust raising the land as much as three feet since the 1990's. 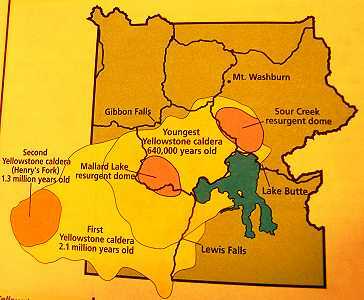 Like the lungs of a sleeping dragon, Yellowstone Caldera rose from 1923 to 1985. Then, from 1985 to 1995 it slightly dropped. 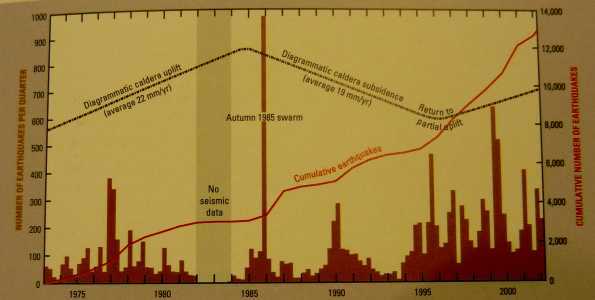 However, from 1995 to 2001, the caldera again rose, accompanied by swarms of earthquakes. CThe eastern edge of the uplift intersects the Yellowstone River at LeHardy. Early explorers described this stretch of river as "fast and smooth." 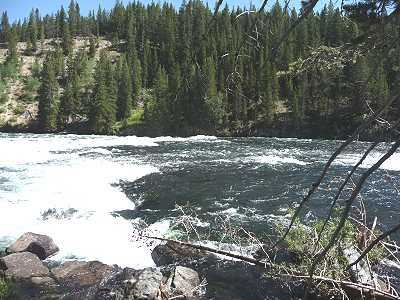 Now there are rapids, where the edge of doming has rifted beneath the river and uplifted the upstream side. 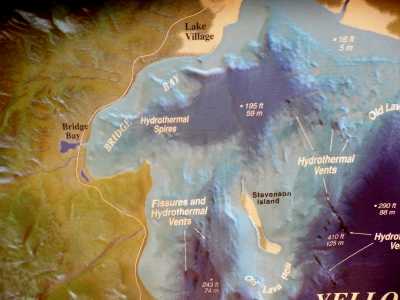 This higher side is the natural control of the level of Yellowstone Lake. CHayden, one of the early government surveyors, aptly called his camp at Yellowstone Lake, 'Earthquake Camp.' And the earthquakes continue to this day. 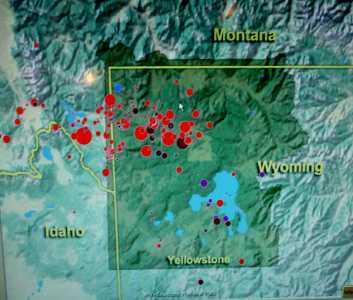 Last year there were 1,283 earthquakes in Yellowstone. There were 450 recorded seisms this June at the 25 seismic stations in the park. CIn August, 1959 my college roommate was doing geologic mapping in the Park. On the 17th, at 11:37pm, a 7.8 magnitude 'quake violently shook him awake in his tent. To his west, half a 7,600 foot mountain ripped apart, sending 44 million cubic yards of rock at 174 miles an hour through a campground. Within moments, at least 28 people had died. Will there be more large magnitude 'quakes? -- yes, it is a geologic certainty. When? With today's technology, impossible to predict. 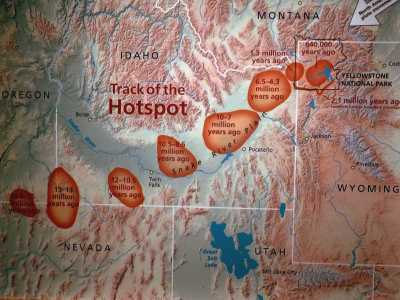 CWill we be able to predict a major eruption in time to warn Park visitors and those living downwind from Yellowstone? Yes, in all probability bulging, seismicity, and changes in heat flow at the surface would give a warning before a large event. GPS stations and satellite images are also being used to keep an eye on the volcano. Forty thermal areas are temperature monitored. 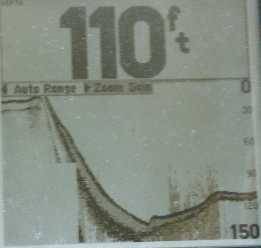 Today there is "no evidence of really unusual events," says USGS geologist Lisa Morgan, an active researcher of the Lake. CHowever, smaller explosions or new geysers or thermal areas are difficult to predict and have injured and killed park visitors, so stay on the trails and obey the warning signs. CThe rock types in Yellowstone are very complex -- there are light-colored rocks and dark- colored rocks. Tough, eh? The light-colored rocks are mostly erupted from explosive volcanos. For those who like to learn names (maybe to impress your teen-age kids, who know everything), call them rhyolite. 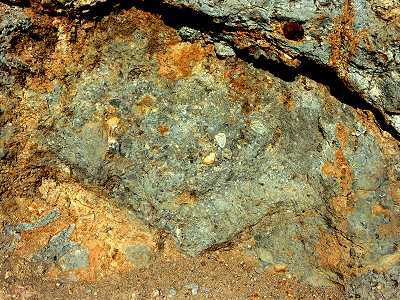 The dark rocks are generally more unusual and are usually from oozing lava flows emerging from fractures (they look like Hawaiian rock) -- basalt. COh, one can make a distinction of the stuff deposited by hot springs and geysers -- here again, basically two types. 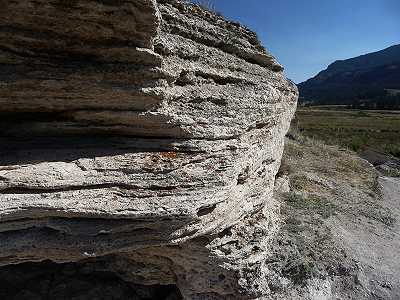 One will bubble with very little dilute hydrochloric acid and is full of lime (once dissolved in the water of the spring) -- these springs deposit travertine, which is basically light-colored (although often 'stained' by colorful bacteria or minerals). CYellowstone is literally a geologic hotbed. 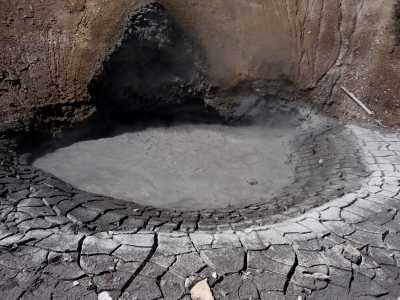 The heat below the park, concentrated by the active hot spot, heats groundwater to superheated temperatures. 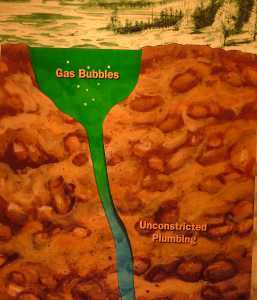 What happens next depends on the plumbing of the overlying rock. If there are open fractures to the surface, hot water or steam can readily escape as hot springs. 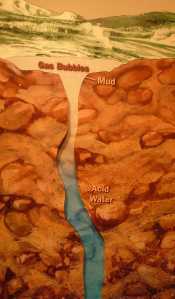 The heat is released and the cooled water runs off or seeps back into the ground. 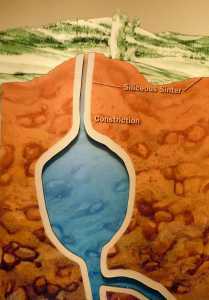 Dissolved minerals readily precipitate around the springs as mounds, layers, or terraces. These are often colorful from the varied chemistry of the minerals in the deposits and from bacteria and algae living in the water. CIf a spring is rich in sulfur, sulfide-reducing bacteria thrive, using the sulfur as an energy source. Their waste is rich with sulfuric acid, which dissolves much of the limey rock of the hot spring leaving insoluble fine silica as mud. 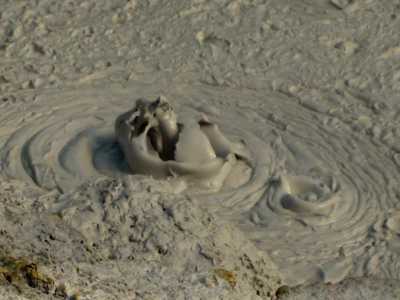 These springs are Yellowstone's famous mudpots. 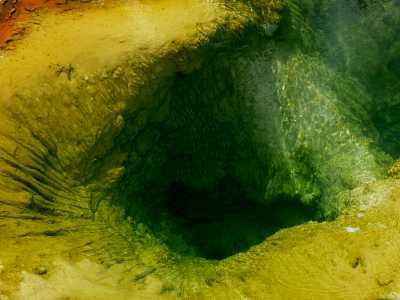 Hold your nose -- the sulfurous gases literally stink like rotten eggs. CIf the plumbing has a restriction, preventing a steady flow of water to the surface, the water trapped below may flash into steam. When this happens the increased steam pressure lifts any overlying water in the fracture or orifice violently to the surface as a geyser. Such occurrences may take place regularly, as with Old Faithful, or at variable and often unpredictable times. CWhen there is little water in the plumbing, but an open vent, there may be a steam vent. These are often noisy and reminded early explorers of the sound of steamboats. CMost lakes just sit there. 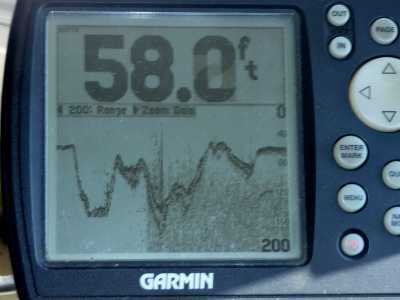 I know, sometimes they get gnarly with wind and waves, but that's surface weather and often can be predicted. CYellowstone Lake is anything but passive. 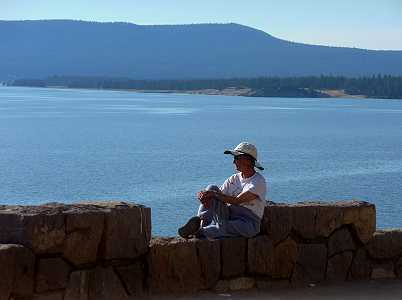 Certainly, when you're a land lubber driving the roads, bordering the lake, the lake often seems peaceful and benign. Even those boating on the lake, with no knowledge of what is seething beneath their hull, usually find cruising here a gentle experience. CDon't be deceived. 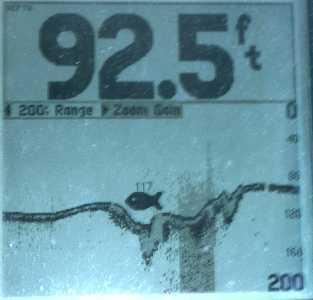 The lake can get the usual wind/waves from storms, but here there is a geological threat hidden below the surface. In an instant, you, your boat, and your world could disappear in a huge wave or a flash of steam. After all, you are cruising inside one of the largest volcanos on Earth. 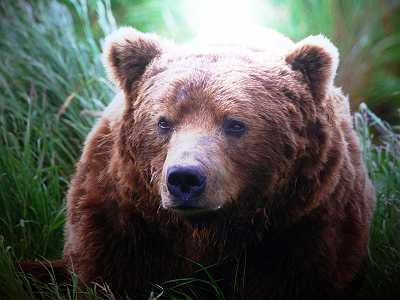 Beneath the passive beauty lies a massive threat! COK. Hop in your boat and let's go for that hot cruise. 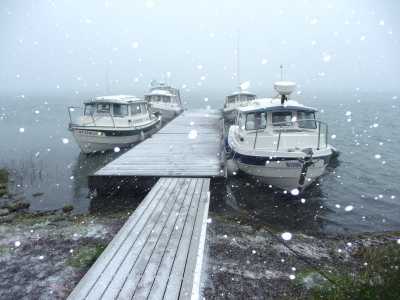 We'll begin at Bridge Bay Marina, up in the northwest corner of the lake. 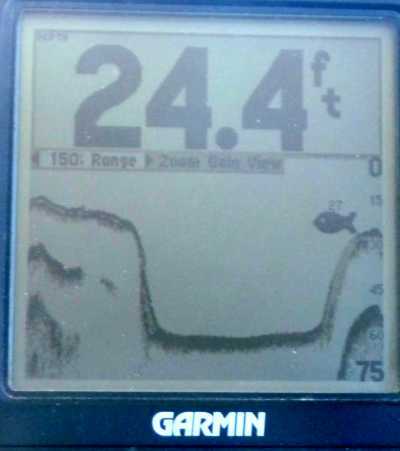 The US Geological Survey, National Park Service, and many Universities and private organizations have been studying the lake bottom extensively since 1999, and the information that follows is largely from these agencies and the US Geological Survey Prof. Pub 1717. 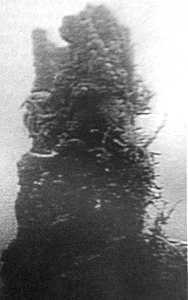 CRemember Bob Ballard and the remarkable pictures of the Titanic taken by his submersible vehicle in the North Atlantic? 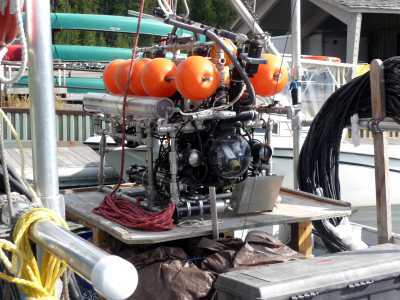 Well, here is an even more sophisticated, remotely operated submersible being used to collect solid samples, vent fluids, temperatures, chemistry, and photographically document the floor of the lake. 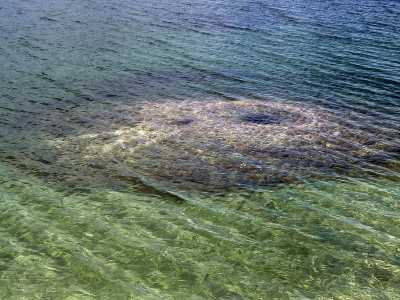 It can also capture samples of sediment and living specimens from the floor of Yellowstone Lake (new species, first time ever seen by man, have been collected by this apparatus). 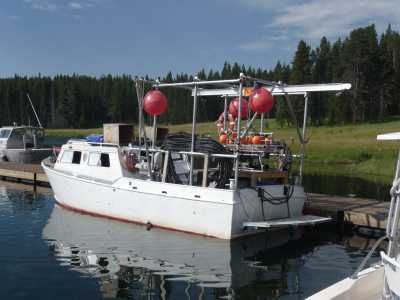 Active research projects studying Yellowstone Lake have been funded and published for years. The results are not only scientifically exciting but also give insight into the risk of future eruptions from the caldera. 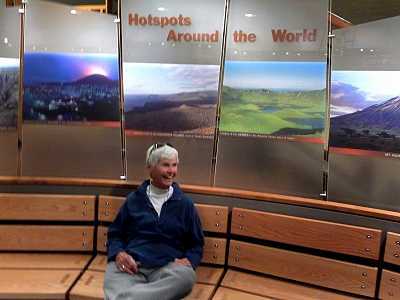 CYou can read and see photos of their work on the Internet or Park Visitor Centers. We will reproduce some of those here. 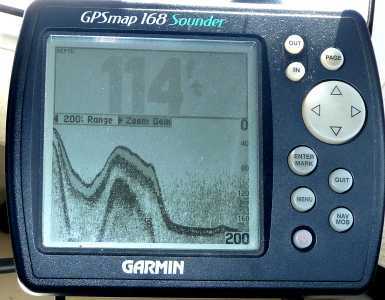 Using these studies as guides, we cruised the lake looking for the features they have described, with our depth sounder. You can do the same, and it makes for an exciting cruise over the volcano. Let's begin in the northern lake. Leave Bridge Bay and cruise a little north and easterly. These are probably Hydrothermal Spires Rising from the Lake Bed 7-10 Feet. 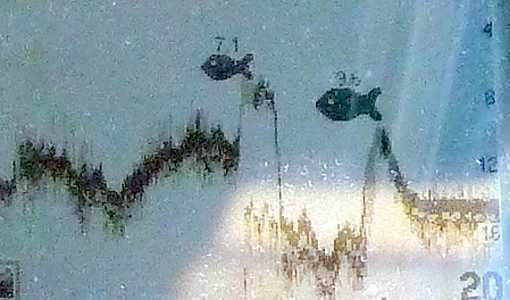 Fish Seem to Like the Warm Water. C Samples taken from a spire, indicated that it was formed by filamentous bacteria and diatoms which were later hardened by amorphous silica. And that's what holds the spire together. They have been dated by the US Geological Survey at over 11,000 years old, so formed just after the last glaciers left Yellowstone. Another View of the Graben. Note Depths - On Land This Would be Visually Striking. 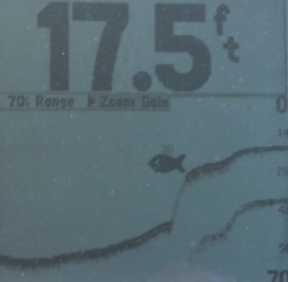 CNote on the map above that a route straight south from the "a" in Village would take your boat over a 'tributary' graben and then over the main downdropped block. Here is the sounder picture of our route south from the "a." CPerhaps the most interesting (and potentially most dangerous) features in the northern lake are hydrothermal craters, such as Elliott's Crater. This crater exploded about 6 to 8 thousand years ago. 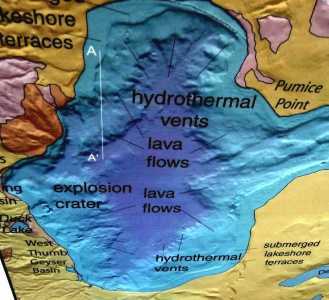 The oldest hydrothermal explosion events started with the Mary Bay explosion at 13.8 thousand years ago. 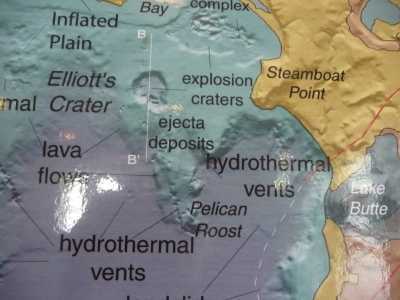 Elliott's Crater, and the complex of craters in Mary Bay, constitute the largest hydrothermal explosion craters yet documented on Earth. 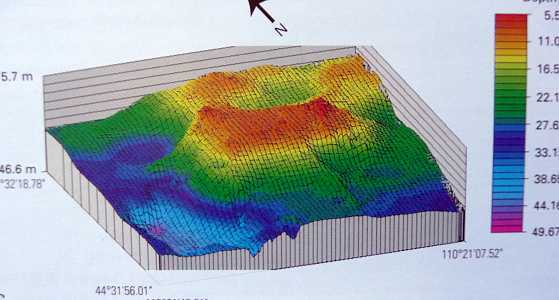 The nature of the crater topography suggest that the large initial explosive event was followed by a period of smaller explosions, probably within a few hundred years of the initial event. 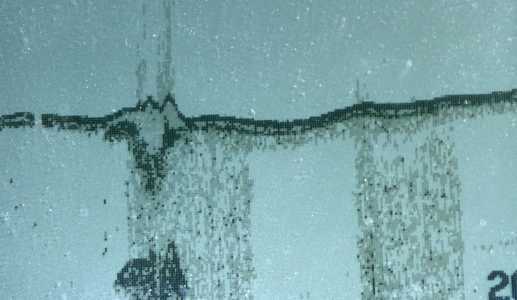 CIt is theorized by USGS geologists that a large earthquake, and resulting tsunamis, may have significantly altered the water level of the lake. 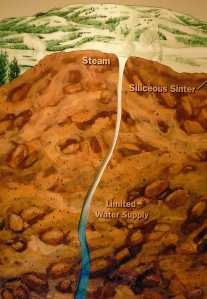 This lowered the weight of water over what may have been a sealed hydrothermal system. This release in pressure may have been a trigger mechanism, much like uncorking a warm shaken soda -- causing an explosion of steam and superheated gases. Mary's Bay Features - WOW! CAlso notice the area on the map marked 'inflated plain.' 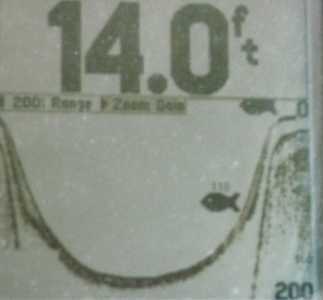 This is a bulge that rises 100 feet from the lake floor, stretches the length of seven football fields, and has the potential to explode at any time. 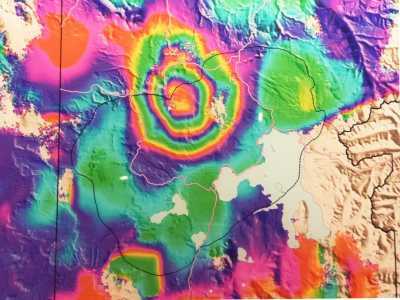 Lisa Morgan, a USGS geologist, is concerned that this bulge could be similar to the nearby Mary Bay and Elliott's Crater explosive features, prior to their eruption. 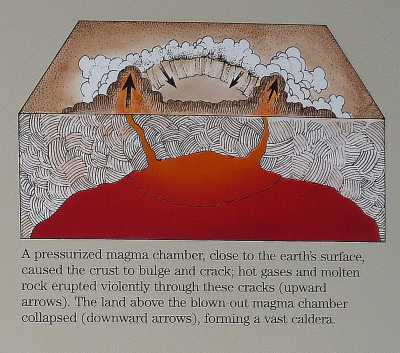 If the "lid on the pressure cooker ruptured, a hydrothermal explosion might release pent-up pressure; in this case, letting loose 10-foot-tall waves, raining chunks of pulverized rock on land, and injecting a plume of steam and poisonous gases through the water. 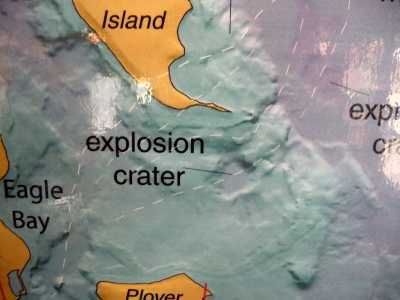 If the entire dome exploded, the explosion could carve an underwater crater stretching up to 2,300 feet across." 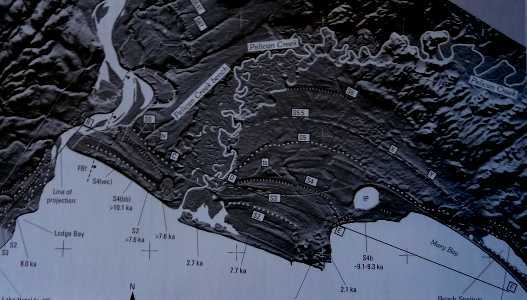 CLet's travel to the south and explore the caldera rim as it cuts across Frank Island. By the way, notice the location of Eagle Bay, part of the mainland to the southwest of Frank Island. This is one of our favorite anchorages on the lake (requires a back country permit from the Park Service). 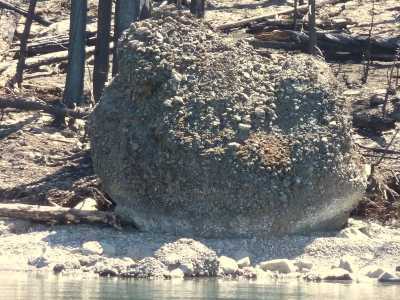 COne hundred forty thousand years ago, plus or minus a day or two, another violent explosion tore a hole in Lake Yellowstone. Tens of thousands of tons of rock, trees, and scattered remnants of life were blasted into the sky and the elliptical West Thumb caldera collapsed. The outline of the caldera is roughly the outline of the Bay, and about the size of Crater Lake in Oregon. CAfter this volcanic eruption and collapse, explosive volcanism continued and rhyolitic lavas were extruded on the collapse margin, as recently as 70,000 years ago. 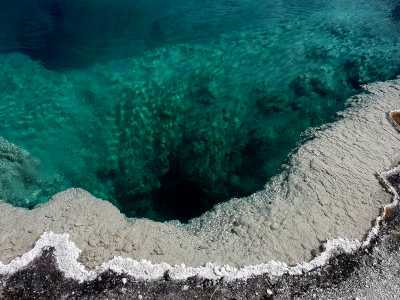 The Yellowstone Caldera has been 'heavy breathing,' inflating and deflating, through time. 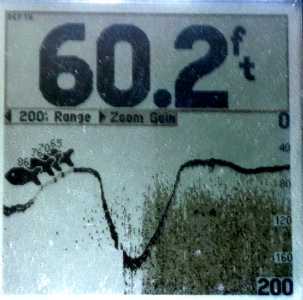 Evidence of a period of 'inhale' and bulging are shorelines, now submerged, during it's current 'exhale'. 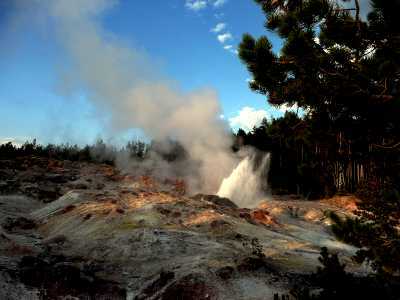 CMore recently, several hydrothermal explosions occurred adjacent to the West Thumb Geyser Basin along the western margin of the West Thumb Caldera. One resulted in today's Duck Lake, occupying the resulting crater, and the other is under the water of the lake (noted as explosion crater above). 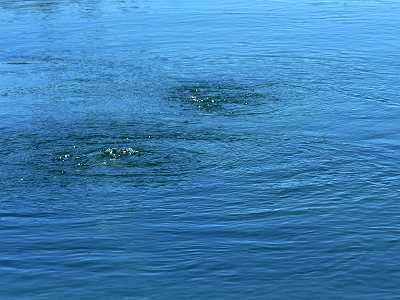 As one cruises from north to south adjacent to the Geyser Area you pass directly over the crater. CDozens of uplifted sediment domes, breached by fluids or gases, are to be found on the lake bottom of West Thumb. 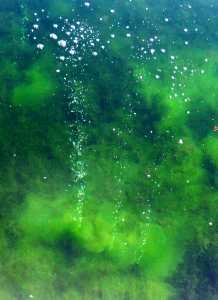 Some, in shallow water, can be located by streams of bubbles coming to the surface. CThere are lava flows and beds of pyroclastic ('fire-broken') debris on many of the prominent points around the lake. Most of these appear to have been emplaced on the land surface or intruded between layers of ash fall, in the shallow subsurface. The few that have been dated, using Argon 40-39 techniques, are about 140-144 thousand years ago. CA tip of the hat, to one of our favorite poets, Robert Frost - "Fire or ice, either will suffice." One of the latest dramatic geologic events in Yellowstone has been periods of glaciation. The latest episode began about 70,000 years ago and finally melted away about 13,000 to 14,000 years ago. 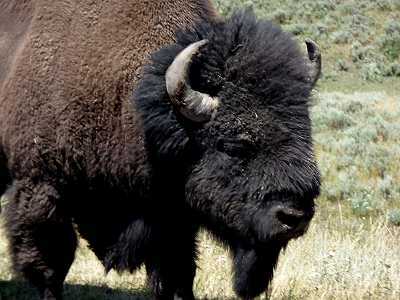 It began during a cold climatic cycle when more snow fell on Yellowstone in the winters than melted in the summers. Slowly the pile of accumulating snow turned into ice until there was a massive ice cap over the park -- perhaps more than 4,000 feet thick! Imagine it -- with the lake surface at 7,733 feet today and a mound of thousands of feet of slowly moving, deeply crevassed ice above. If you had the ability, as some birds then did, to fly over Yellowstone you would be gazing down on a region that appeared similar to central Greenland today. Even the summit of Mt. 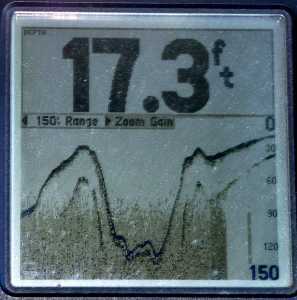 Washburn shows signs of glaciation. 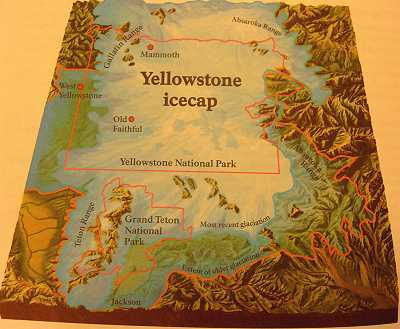 C Actually, ice periodically covered Yellowstone over the past two million years. 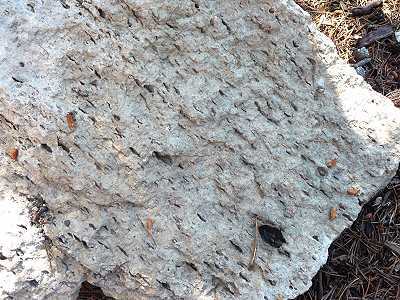 A glacial deposit near Tower Falls dates back 1.3 million years - a geologic rarity since later glacial periods usually erase evidence from earlier periods of glaciation. C Ironically, the hot spot was part of the cause of the extensive glaciation -- it bowed up the land high enough to increase glaciation in this region. The Yellowstone Glaciers were apparently localized by this upbowed highland and were not part of the great continental ice sheets that covered much of northern North America. C The pile of glacial ice began to flow outward under the pressure of its own weight. It scoured former river valleys into deep sharp-sided troughs, stripped soil off the land surface, and weighed down the crust. In the last phase of glaciation, only tongues of ice would have remained, sliding down from highlands through valleys, surrounded by slowly emerging land. These tongues modified what little rock debris remained -- seen today as hummocky hills and sinuous heaps of gravel and sand. Huge boulders, ripped from underlying rock by the ice, some transported within the ice and within floating icebergs, and some by roaring meltwater streams, lie scattered about the park and along the shores of the lake. CWe have traveled in Iceland, and seen the effects of volcanic activity beneath glacial ice. During eruptive phases, huge lakes of water form beneath the glaciers, only to break free into massive floods that roar across the land surrounding the ice -- lahars, the Icelanders call the floods that periodically destroy highways, farms, and lives. One can only imagine the lahars that must have devastated Yellowstone during times when fire and ice struggled for supremacy. CA cruise in America's oldest National Parks, through great scenery and amazing volcanic/hydrothermal sights is truly one of the finest and most unique cruises in North America. On days of wind, when the lake is riled up, imagine the plethora of activities on shore -- animals to view, geysers to impress, hot springs and mud pots to enjoy. Truly a gem!